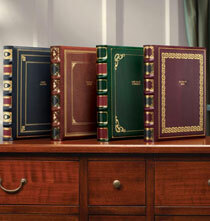 A Library photo album spine label matches our top-grain antiqued leather photo album that features ornate, beautiful gold tooling on it's cover and spine. Handcrafted in the USA. Album is 10” x 11”. I have been using these spine labels since the 1990's on our photo albums, esp. those dedicated to trips. They look great, help to keep the albums organized. They have never lost their adhesive properties! Love them. I have so many albums that I have purchased from Exposures over the years and I really needed a way to start to identify what is in them. I started putting the spine patches with the date of the album contents but, I have pictures of trips that are in three or more albums. I had to order more spine patches to make sure they were in order (i.e. 1 of 3, 2 of 3, 3 of 3, etc.) and they make the albums look so much nicer and easier to take out the right album instead of looking through them to find the one I want. I recently ordered 23 of them to put the "finishing touch" on my albums and they look great. I was missing 6 of them and I called customer service. The young man I spoke with was so helpful and told me he was sorry that had happened and they would be shipped out so I could expect to have them in 4-8 business days. I received them yesterday. I appreciate the customer service and I am so glad I started using the spine patches on my albums. They really do give my albums a more attractive look and help keep things organized. I love the spine patches and they look great. Only problem is that after about 4 years, they come up at the edges a bit. Only noticeable to persons who have a lot of these books (I do) and you see the difference between an old patch and a new one. I've used these before n love themâ??ï¸? They work on the albums I already have. I've purchased albums for years and yearsâ?¦.look up my record! These spine labels are perfect with the Library Leather Photo albums. All our albums are labeled this way. BEST ANSWER: Thank you for your question. The Corner Dots and Floral Scroll is 1 5/8 W x 1 5/16 H, the Scroll is 1 5/8 W x 1 1/4 H, and the Floral Corner is 1 3/8 W x 1 1/4 H.We hope this information will be of help to you. What are the dimensions of each label? BEST ANSWER: Thank you for your question. All the styles are the same size of 1 5/8". We hope this information will be of help to you. What are the dimensions of these labels? What holds them on the album? Adhesive? Will it come unstuck? BEST ANSWER: There is an adhesive on the back of the label. Make sure your hands are steady and you place it exactly where you'd like it to be because once it is on - it's on. If you try to remove it to re-position it you will ruin it. I have had some on for years and they are fine. They should be kept in an area that doesn't get too cold or too hot because it may affect the adhesive eventually and cause it to curl up at the corners. They add a nice finishing touch to albums. It's adhesive, but really strong. I've had mine on for over 10+ years and they are still stuck VERY firmly in place. I was worried too, but they are really stuck! The back of the labels are adhesive. If the spine of the album is flat they will stay securely attached. BEST ANSWER: The patches are designed to match the corresponding leather album designs. Select the color of your album, then choose the patch that goes with it. I don't believe you can choose, say, the design for the green album and ask for it in red, for example. Thank you for your question. At this time the designs only come in the only color shown in the pictures. The color can not be changed. We hope this information will be of help to you. Yes,you can pick any of the 4 colors offered to go on your album selection or select the color of the patch that Exposures has shown matched up with the Album. does this item come in navy? BEST ANSWER: I doubt it. They are each colored to match the bottom square on their corresponding leather album. 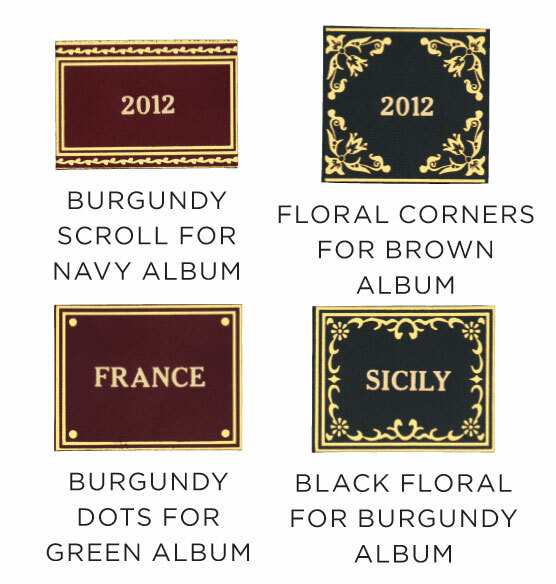 For example, I have bought several of the burgundy albums, and the spine patch that goes with them is black and fits over the bottom square of the leather spine, which is also black in color. The spine patches are not the same color as the albums they go with. Hope this helps. Thank you for your question. 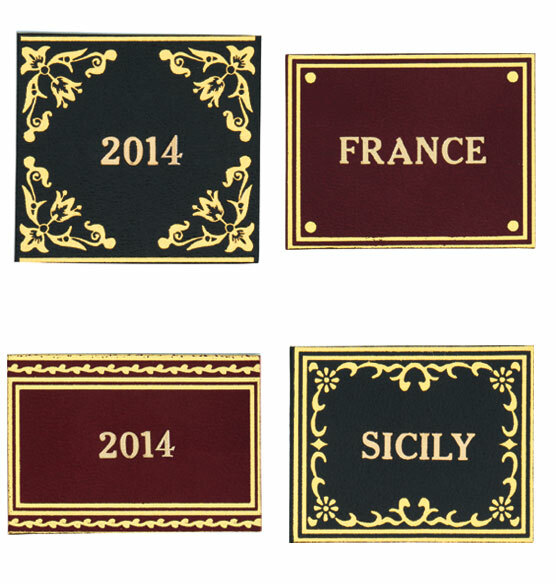 The Library Photo Album Spine Labels only come in the burgundy and black designs as shown. We hope this information will be of help to you. ARE THE PICS ATTACHED OR CAN THEY BE INSERTED? BEST ANSWER: The pics are attached. I like o use glue dots. Very easy and look nice. So enjoy these albums! can i get the label with corner dots in any color? BEST ANSWER: Thank you for your question. The dots only comes in the burgundy color as shown. We hope this information will be of help to you. Do you have labels you make up to stick on album covers? I am putting together parent wedding albums and want to include the first names of the couple and the full wedding date. I am using Pioneer screw post bound albums which will have only about 30 photos, so I think the spine ones won't work. BEST ANSWER: Thank you for your question. We do not have labels for the front of an album. We hope this information will be of help to you. BEST ANSWER: Thank you for your question. Unfortunately no this spine patch is not large enough to fit that personalization on it. We hope this information will be of help to you. which design is the scroll? BEST ANSWER: Thank you for your question. Next to the other smaller pictures on our website lists which design the spine patches are. We hope this information will be of help to you.